CHIMBOTE, PERU – Three priests who were martyred during an attempt by guerrillas to overthrow the government of Peru in 1991 were officially honored by the Diocese of Chimbote from December 4 through 6. 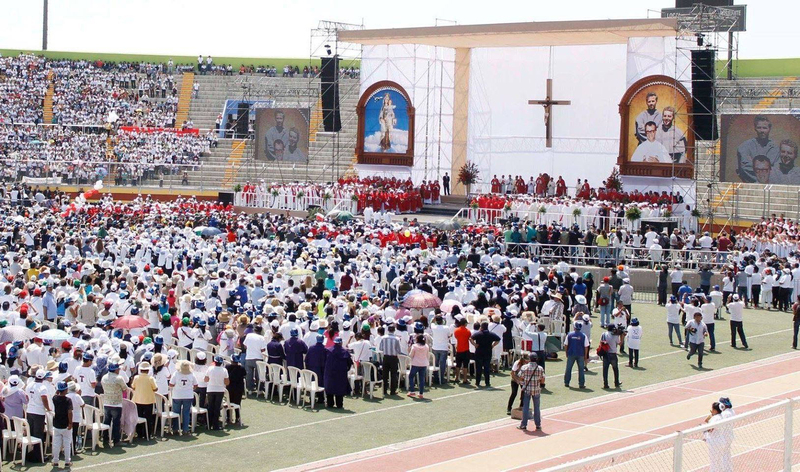 The climax of the celebration was the beatification Mass in the presence of more than 30,000 faithful, including Dominican Sisters of Peace Thoma Swanson, Susan Leslie, Manuela Crisologo Gonzalez and Gemma Doll. Srs. 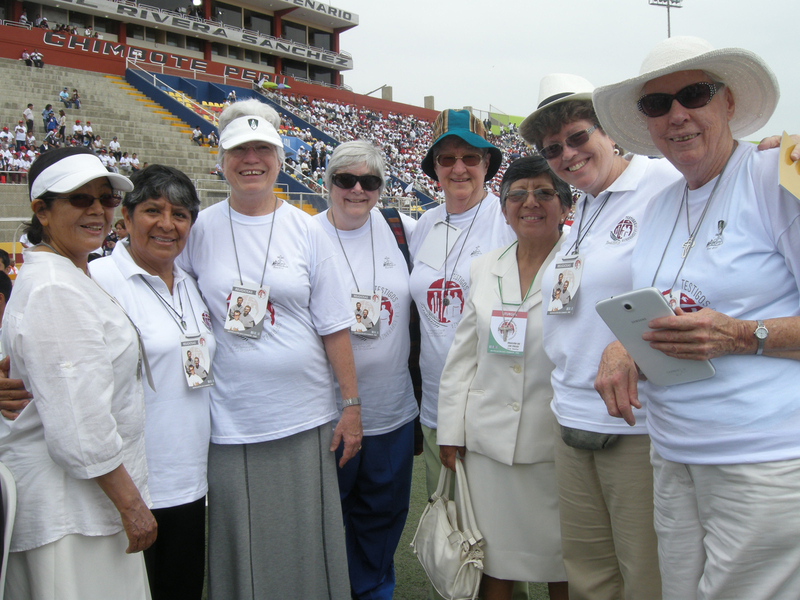 Manuela Crisologo Gonzalez and Susan Leslie are missionaries in Chimbote and were members of the Chimbote diocesan social action delegation, which planned some of the events leading to the beatification. The three priests, Zbigniew Strzalkowski, Michal Tomaszek and Alessandro Dordi, died at the hands of the Sendero Luminoso (Shining Path) guerrilla movement. During the takeover attempt, the guerrillas accused the Church of supporting the “Yankee imperialist” Caritas and weakening the people’s revolutionary potential by encouraging religion. They targeted priests, pastoral workers and ordinary Christians working to relieve the suffering of the poor. Sendero Luminoso threatened to kill a priest a week in the Chimbote Diocese the summer of 1991. On August 9, two Polish Conventual Franciscans, Frs. Strzalkowski and Tomaszek, were kidnapped and murdered. They had been working in the mountain parish of Pariacoto for less than two years. Sr. Mary Ann Connolly, OP, a Dominican Sister of Peace and a missionary there at the time, remembered the two young priests as quickly learning the language and making themselves one with the people of their parish. “They worked to improve lives both spiritually and materially,” Sr. Mary Ann said. Two weeks later, an Italian priest, Fr. Alessandro Dordi, pastor of the Santa parish for 11 years, was murdered. “The terrorists wanted to destroy them forever but for the Church today they are martyrs of faith and witnesses of hope,” said Fr. 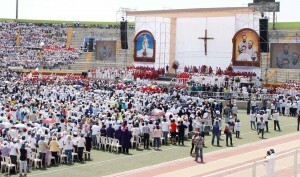 Juan Roger Rodriguez, president of the Chimbote Diocesan Committee for Beatification. What a witness of integrity and courage. God is alive and with his people. What an inspiring event! Thanks to our Sisters Susan, Manuela, Thoma and Gemma who represented the Dominican Sisters of Peace at the beatification of the three priest martyrs. I am moved when I realize that some of our sisters knew and worked with these priest martyrs of Chimbote. I am happy that you, Thoma, could be present for this very special occasion because you were there when these asassinations took place.